On Thursday, March 10th, Urban Nutrition‘s Miki Palchick spoke to the Workshop School Home School Alliance about the importance of eating and cooking well. 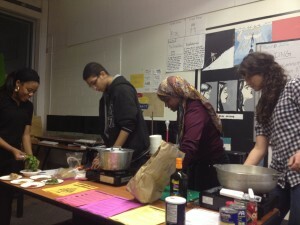 Miki shared easy, nutritious recipes with the HSA, and conducted a cooking demonstration with students. Additionally, Miki talked about how we are all connected through food. Students and guardians shared stories about their culture and heritage by recalling memories about their grandparents’ and relatives’ favorite dishes. 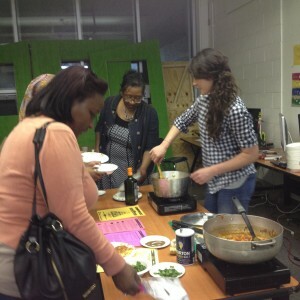 As we enjoyed spicy chickpeas and vegetable couscous, the HSA told stories about their families’ cultural traditions from places such as the American South, Puerto Rico, and Northern Africa. At the end of the demonstration, Miki gave the group spices and recipes to take home to share with their families.